With this article on Zaha Hadid—the subject of a retrospective currently on view through October 25 at the Solomon R. Guggenheim Museum in New York—Hal Foster inaugurates a series of occasional essays on contemporary architects. The careers of several prominent designers have lately matured to the point where their shape, scope, and significance may now be grasped, in part through new exhibitions and publications. More important, architecture has once again captured the imagination of the public, which has come to view it as a principal medium for the branding of institutions of many sorts. In this service, architecture has attracted some of the attention once devoted to art; at the same time architects have shown an increased intimacy with artists—not only through the great prominence given to art museums but also through a shared interest in imagemaking and space-shaping. Finally, perhaps even more so than art today, architecture focuses urgent questions about new kinds of representations and media, materials and technologies. In fact, as was the case a century ago, it may be in architecture that we can best glimpse the look of modernity today. In the last few years Zaha Hadid has graduated from being a cult figure in architecture schools—the diva of the discipline—to being a celebrity architect, with credibility enough in boardrooms to have several large projects completed and several others launched. In 2003 the Lois & Richard Rosenthal Center for Contemporary Art in Cincinnati, her first structure in the United States, opened to great acclaim; in 2004 she won the prestigious Pritzker Architecture Prize, the first woman to be so honored; in 2005 her BMW plant in Leipzig, which proved her ability to design for industry, was completed; and now, in 2006, has come a retrospective of thirty years of her work. (Frank Gehry is the only other contemporary architect whose work has occupied the entire spiral of the Guggenheim.) Hadid can no longer be dismissed, as her critics were wont to do, as an affirmative-action case with more splash than substance—as a brassy woman in a male-heavy profession who stands out on account of her outsize personality and exotic background (she was born in Baghdad in 1950). Indeed, many believe that Hadid has done more than any other active designer to push the parameters of architecture, mostly through rethinking its old representational modes and anticipating its new computer possibilities. 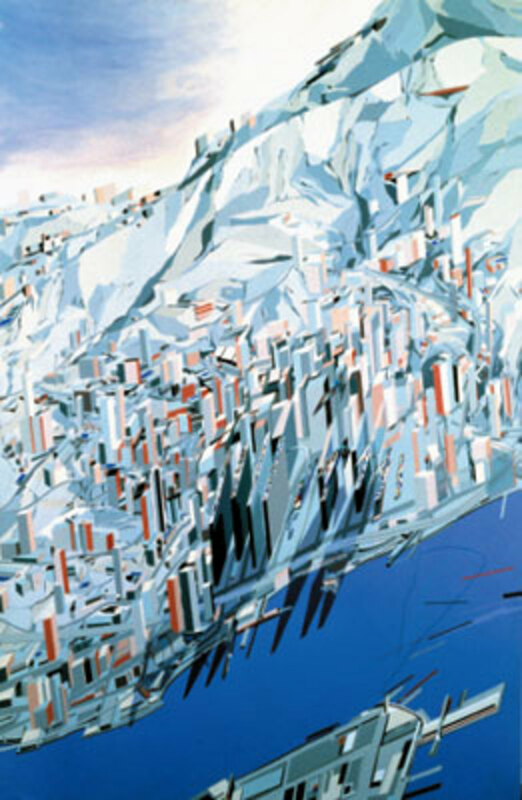 Zaha Hadid, The World (89 Degrees), 1983, acrylic on canvas, 83 7/8 x 72 1/16". Kazimir Malevich, Suprematism (Supremus No. 56), 1916, oil on canvas, 31 3/4 x 28". Zaha Hadid, The Peak: Blue Slabs, 1983, acrylic on paper, 111 x 72 1/6". From the project The Peak, Hong Kong, 1982–83. The turn to abstract painting in order to loosen architectural representation from its restrictive conventions was a brilliant opening, but it produced a problem of its own, for rendering architecture so pictorial, even diagrammatic, also makes it weightless, almost immaterial. Hadid points to this tendency in her own descriptions of the early projects, where she writes, for example, of “floating pieces” of architecture “suspended like planets.” (9) How, then, to reground structures that have become so unmoored? This is where her engagement with Constructivism comes into play; in effect Hadid deployed it as a materialist counterweight to the airborne idealism of Malevich and his followers. “The opposition between Malevich’s Red Square and [Vladimir] Tatlin’s Corner Relief” governed her work from her designs for Koolhaas and Zenghelis in the late ’70s (in their fledgling Office for Metropolitan Architecture), designs that strive to hybridize the different languages of Suprematism and Constructivism. (10) Hadid pursued this synthesis in her own office after 1979, especially in The Peak of 1982–83, her winning entry in a Hong Kong competition that first brought her recognition in the architectural community. She describes this cliff-top resort (which was not built) as “a Suprematist geology,” a paradoxical phrase that points to the tension between the principles represented by Malevich and Tatlin. (11) Yet it was her very ability to make this opposition generative in architectural terms that advanced Hadid—that positioned her, first, to be included in the landmark “Deconstructivist Architecture” show curated by Mark Wigley and Philip Johnson at the Museum of Modern Art in 1988 and, then, to be tapped as the designer of “The Great Utopia” exhibition at the Guggenheim in 1992–93 (which restaged the old rivalry between Malevich and Tatlin). 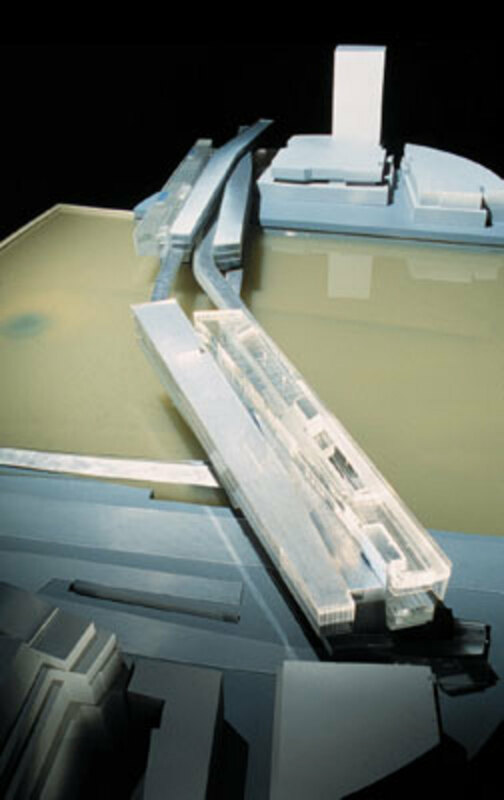 Zaha Hadid, Wish Machine: World Invention, Kunsthalle Wien, 1996. Photo: Zaha Hadid Architects, London. Zaha Hadid, Habitable Bridge, 1996, London. Model. No one would confuse Hadid with a functionalist, for often in her practice function seems to follow structure, and structure to follow imagination. At the same time, despite her active invention of semiautonomous shapes, she is not quite a formalist either. Rather, the primary motive of her architecture seems to be the release of forces detected in a given project or site, out of which unforeseen structures, spaces, and functions might then be developed. This attention to force points to historical precedents other than Suprematism and Constructivism, precedents that her Russian proclivities have tended to obscure: Futurist and Expressionist architecture. This is an affinity that her own language often betrays. “The whole building is frozen motion,” Hadid remarked of her first signature building, the Vitra Fire Station, “ready to explode into action at any moment”; and more generally she has called for a “new image of architectural presence” with “dynamic qualities such as speed, intensity, power, and direction.” (19) What could be more Futurist in spirit than such statements? “Let’s split open our figures,” Umberto Boccioni proclaimed in 1912, “and place the environment inside them. We declare that the environment must form part of the plastic whole, a world of its own, with its own laws: so that the pavement can jump up onto your table, or your head can cross a street, while your lamp twines a web of plaster rays from one house to the next.” (20) As much as any architect since that moment, Hadid has responded to this Futurist call for an opening of structure onto space, an interpenetration of interior and exterior, an intensification of “figure” and “environment” alike. Certainly the planar vectors in her paintings and buildings often seem to fly out of a Futurist box of forms. Zaha Hadid, Hotel and Residential Complex, 1990, Abu Dhabi. Model. 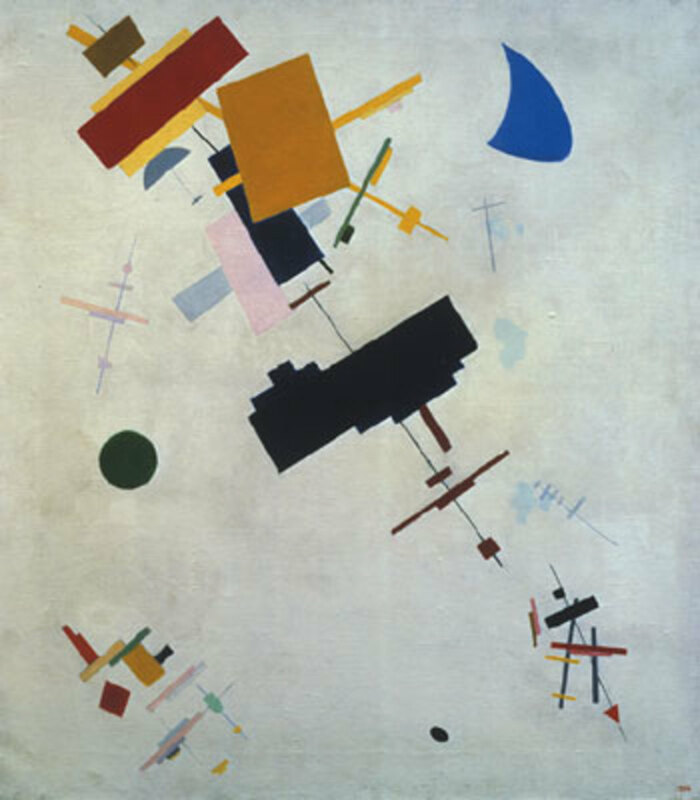 Moreover, just as the Constructivist dimension in her early work grounded its airborne Suprematist aspect, so an Expressionist dimension in her later work controls its dynamic Futurist aspect. Some of the forceful geometries that Hadid has proposed or built since the Vitra Fire Station are modeled in massive materials such as concrete, and more and more she has tended to an Expressionist sculpting of large volumes. For example, the sleek but heavy profile of her Landesgartenschau (1996–99), an exhibition hall and research center in Weil am Rhein, Germany, suggests a synthesis of Futurist speed and Expressionist modeling, and the same is true of her Ordrupgaard Museum extension (2001–2005) in Denmark, which suggests an elegant bunker, her celebrated BMW plant (also 2001–2005), and other recent buildings. Current projects include a media center in Pau, France, a train station in Naples, and an aquatic stadium for the London Olympics, all of which evoke Futurist concerns with image, movement, and sport, and yet Hadid has modeled them, too, as so many Expressionist shapes. Zaha Hadid, Department of Islamic Art, Musée du Louvre, 2005, Paris. Rendering. This leads to a final question. One strain in the Hadid literature argues that her multiple perspectives, layerings, interpenetrations, and distortions anticipated design parameters that have become viable only with recent computer programs—more, that her visionary demands prodded these technical advances along (Schumacher, for example, writes of a “dialectic amplification,” or feedback effect, between her architectural schemes and digital tools). (22) Along with Gehry, Hadid is indeed a prime candidate for lead architect of the computer age, and like him she is attracted to “total design” (there is a “Z” line of silverware and furniture as well as a prototype for a futuristic car). Yet clearly this position is ideologically fraught, and it has led her associates to dubious pronouncements about the primary role of contemporary architecture (“more than ever,” Schumacher asserts, “the task of architectural design will be about the transparent articulation of relations for the sake of orientation and communication”). (23) According to some new-media enthusiasts, critical inventions of modernism such as montage are now absorbed by computer programs as so many automatic options, and this kind of argument has also served to position Hadid at the forefront of avant-garde design. “The model for her work,” Betsky writes, “is now the screen that collects the flows of data into moments of light and dark.” (24) Yet is this all that it might mean to further “the incomplete project of modernism” today? (25) Is this the first and last context for “new fields of building”? Hal Foster is Townsend Martin Professor of Modern Art and chair of art and archaeology at Princeton University. 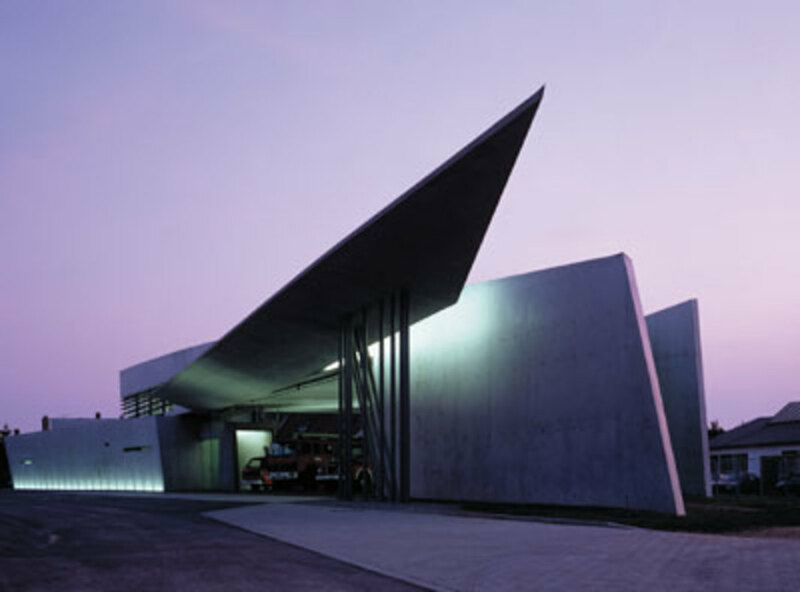 Zaha Hadid, Vitra Fire Station, 1990–94, Weil am Rhein, Germany. Photo: Christian Richters. 1. The exhibition, curated by Germano Celant with the assistance of Mónica Ramírez-Montagut, is accompanied by useful essays by Celant, Joseph Giovannini, Detlef Mertins, and Patrik Schumacher. 2. Zaha Hadid, in Zaha Hadid: The Complete Buildings and Projects (New York: Rizzoli, 1998), 24. 3. See Reyner Banham, Theory and Design in the First Machine Age (London: The Architectural Press, 1960). 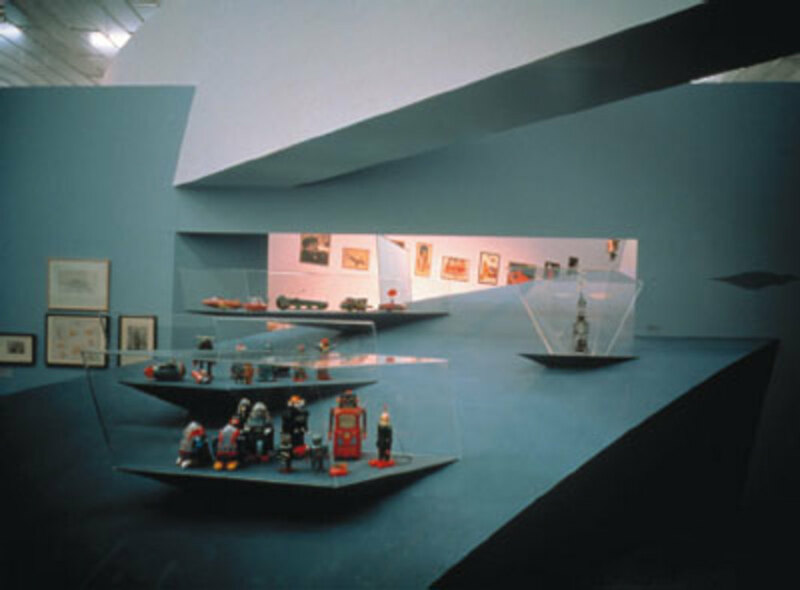 When Banham highlighted Futurism and Expressionism, he did so in part because he felt that postwar design must be concerned, as he believed these movements were, with the imaging of new technologies (see my “Image Building,” Artforum, October 2004). At least in this respect Hadid might be considered a latter-day Banhamite (more on which below). As for the reception of the Russians at this time, see Stan Allen and Hal Foster, “A Conversation with Kenneth Frampton,” October 106 (Fall 2003). 4. On the other hand, Hadid might be aligned with the very different enterprise of postmodernist art, which is (was?) to rethink representation rather than to restore it. 5. Kazimir Malevich, “Non-Objective Art and Suprematism” (1919). There are various translations; I have used the one in Larissa Zhadova, Malevich: Suprematism and Revolution in Russian Art 1910–1930 (London: Thames & Hudson, 1982). 6. 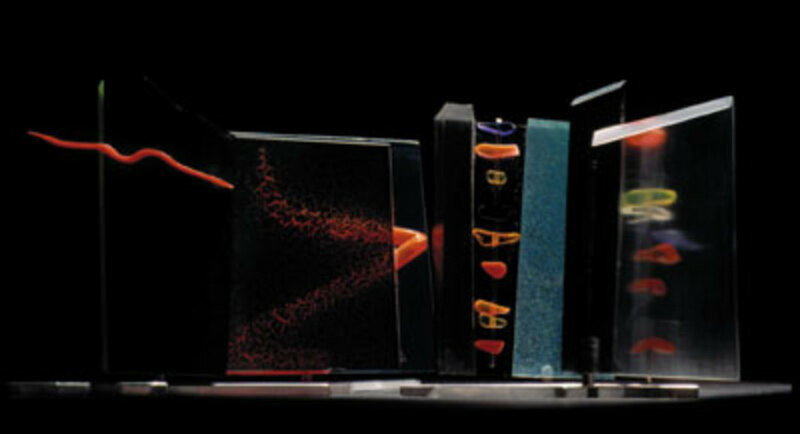 Multiple views within an image suggest mobile views, which implies that it is time that has here entered space and so transformed (deformed) it. This rethinking of architecture in terms of temporality—of passage or even narrative—points to the possible influence of another young AA teacher during these years, Bernard Tschumi. 7. Hadid, in Zaha Hadid (1998), 68, 24. 8. Aaron Betsky, “Beyond 89 Degrees,” in Zaha Hadid (1998), 9; Patrik Schumacher, Digital Hadid (Basel: Birkhäuser, 2004), 5. 9. Hadid, in Zaha Hadid (1998), 19, 20. 13. It might be argued that Hadid pushed architecture to such a point of abstract autonomy that it had to confront its own (delayed?) modernist dilemma: how, given this apparent freedom of form-making, to motivate its decisions, to fend off arbitrariness? 14. As noted, Koolhaas explored Constructivist architecture at the AA, yet in Delirious New York (1978) he also proposed a dialectic, in modern architecture, of the rational and the irrational (in the persons of Le Corbusier and Dalí). This attention to desire and fantasy may have influenced Hadid as well. 15. Schumacher, Digital Hadid, 17. As Schumacher points out, these distortions can also unify space. 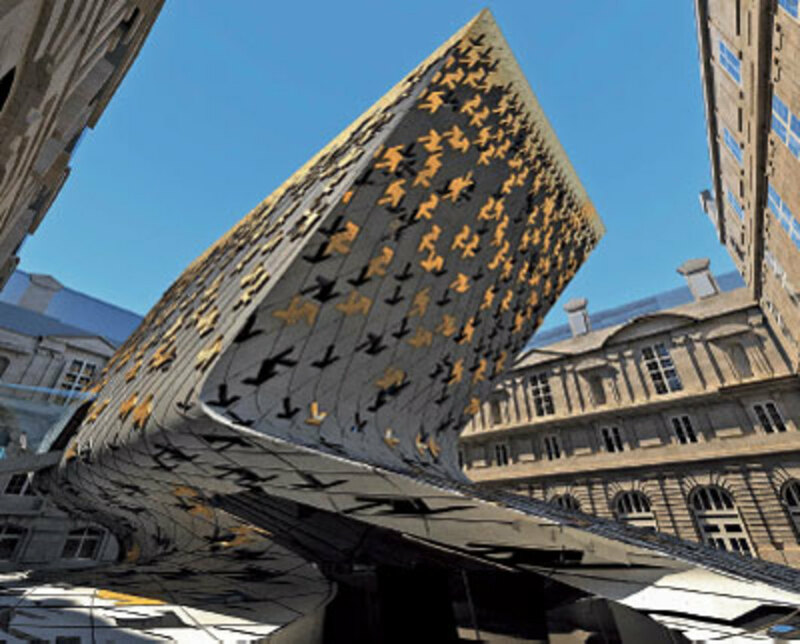 In this respect, too, Hadid is part of a Baroque turn in contemporary architecture (the Baroque, that is, as read largely through Gilles Deleuze). 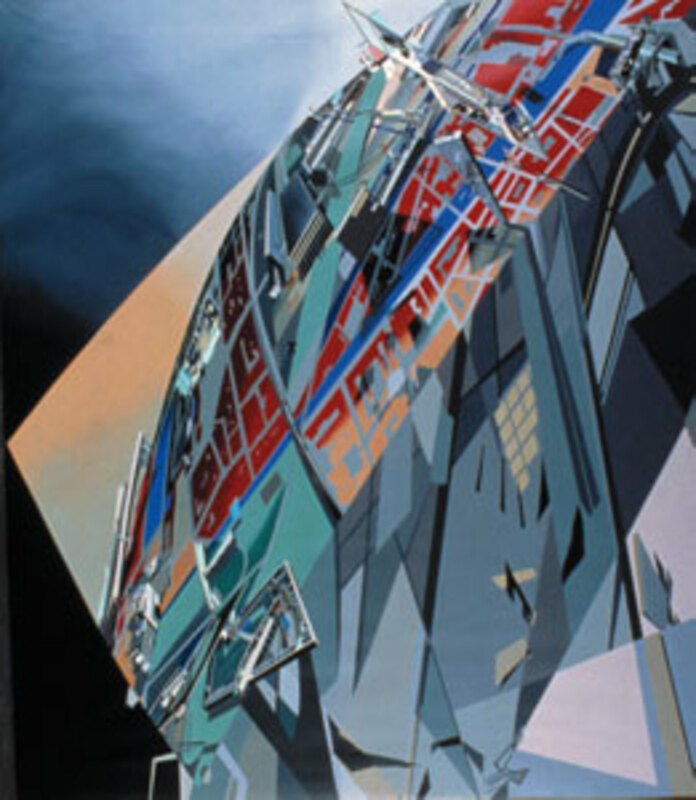 Schumacher also points out that Hadid, like Eisenman, leaves a question unanswered here—“which features of the graphic manipulation pertain to the mode of representation rather than to the object of representation”?—a question that is hardly restricted to contemporary architecture (indeed, it may be the primary epistemological question of our time). Finally, in terms of representations projected into objects, Constructivism again emerges as a precedent (Constructivism understood broadly, from El Lissitzky, say, to Theo van Doesburg), for it too used exploded perspectives and axonometric projections as the generators of design. 16. Hadid in Zaha Hadid (1998), 135. 18. As projects brought to Hadid have increased in scale, her attention has turned to the skyscraper (which certainly complicates her prior privileging of the horizontal axis). For a discussion of this new direction in her office, see Patrik Schumacher, “The Skyscraper Revitalized: Differentiation, Interface, Navigation,” in Zaha Hadid, exh. cat. (New York: Solomon R. Guggenheim Foundation, 2006), 39–44. 20. Umberto Boccioni, “Technical Manifesto of Futurist Sculpture,” in Futurist Manifestos, ed. Umbro Apollonio, (London: Thames & Hudson, 1973), 63. Here Boccioni points to what a truly Futurist architecture might be more persuasively than does Antonio Sant’Elia (who was largely dragooned into the movement). Boccioni also used axonometric projections in his sculptural practice. 21. Put otherwise, Hadid may not escape the charge that Peter Bürger laid against the neo-avant-garde project in his Theory of the Avant-Garde (1974): that if a movement like Constructivism failed in its critique, then to repeat such a failure—more, to recoup its critique for the very institutions it sought to challenge—is to risk farce. 22. Schumacher, Digital Hadid, 7. 23. Schumacher, “The Skyscraper Revitalized,” 44. 24. Betsky, “Beyond 89 Degrees,” 13. 25. Schumacher, Digital Hadid, 20. Jürgen Habermas first used this phrase in the early 1980s, and, following Hadid, her supporters have adapted it to describe her practice as well. And yet the Habermas term is “modernity,” not “modernism.” This slippage may seem slight, but it suggests a detachment of modernism from the greater project of modernity, a detachment that tends to reduce modernism to a repertoire of styles less able to engage the values of modernity, let alone the processes of modernization, critically.